Upscale 4BR Home with Stunning, Panoramic Views! Lovely 4 bedroom home with swimming pond and Stunning Views! Brand new listing! Available for Christmas and New Year Holidays! This 3 bedroom + apartment home is perched on an extraordinary estate high above the Stowe valley, less than 10 miles from Stowe Mountain Resort. The three bedroom main house is connected by a mudroom to the garage and apartment. The dining room, which seats 8 and has additional seating for 6 in the attached enclosed sunroom, with cocktail bar and exquisite views make it perfect for entertaining all year long. A well-equipped kitchen with island seating and modern stainless steel appliances makes meal prep a family affair. 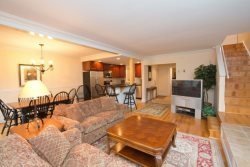 The cozy living room with gas fireplace is ideal for family time or enjoying a good book for some quiet time. The entertainment area has 30 games/card games/board games, a PS4 with over 35 games, 65-inch TV and wraparound leather couch. Family game night will be lots of fun!